The Boston Philharmonic, Benjamin Zander, conductor, offered Gustav Mahler’s Symphony No. 2 in C Minor, “Resurrection,” on Good Friday. A “concert experience” it would be for some of the vast gathering at Symphony Hall and perhaps for others a time of meditation. 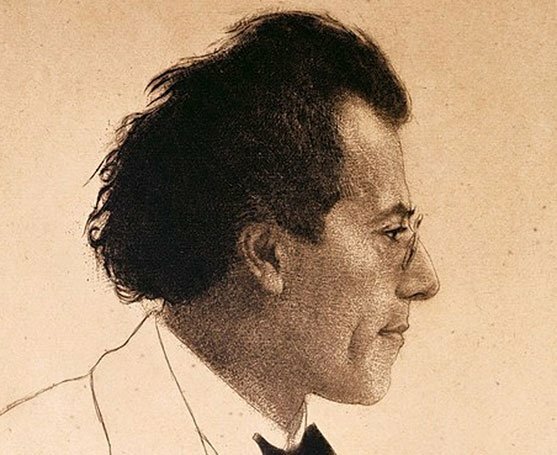 The timing of Mahler’s deeply personal inquiry during Easter and Passover season continues the original intent of music, its bonds with life, and here, as well, with death. For this symphony, far more than the usual tallies of instruments were in place onstage. In addition, there were two soloists, soprano and contralto, a large chorus, and brass bands offstage. Well-known is the fact that conductor Zander has dedicated much of his lifetime peering into Mahler and his music. 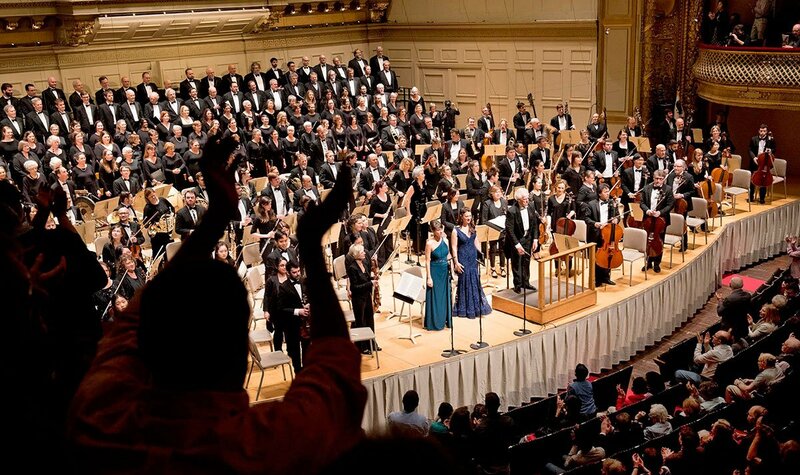 And being the teacher that he also is, he summoned all these forces, the Boston Philharmonic, the soloists Sonja Tengblad and Claudia Huckle, and the Chorus pro Musica, to an informed and unified expression at once dreadful and joyful. There is always wonderment when such mass of musicians muster those levels of endurance, of focus, of accomplishment required over five movements, over an hour-and-a-half, which is the length of this symphony. Friday evening’s total running time was one hour and twenty six minutes including the pause after the first movement called for by the composer. During that time, Zander sat beside the podium wiping away perspiration from his face with a handkerchief. Unmissable was the terror from rumbling strings and blaring brass, from Philharmonic’s undisguised underpinning of a march motion destiny-bound. With a dying out of hushed harps, the strings sun lit Mahler’s pianississimo heavenward ascent via a simple major scale. The English horn solo, persuasively pastoral, succumbed to a crescendo at first with marching victoriously then filing catastrophically. The repeated blasts over and again of a single chord was one of many horror-filled moments. There were many other extraordinary details heard from all around the Boston Philharmonic in the Allegro Maestoso and throughout the entire performance. The second movement, Andante moderato, settled in immediately in a perfect tempo lovingly loosened as in country-like dancing, always sustaining great care and clarity. Looking back, then, to the preceding movement with all its own hugely contrasting and shifting ways, it seemed there could have been finer dynamic control. Zander drew fetching instrumental interplays of swirling winds and strings. Drama inducing stationary signals from long-held woodwind notes, near sinister and near triumph brasses almost completely spiraled, this, the third movement, into a Mahler orbit. “Urlicht,” the fourth movement, surely conjured medieval landscapes. Low brass made out as organ, a richly merged harmony, serene, a rare moment, one to be remembered. The evocative, mellowed contralto Claudia Huckle embraced “Primal Light” profoundly absorbing its pain and bliss and rendering all that with all the understanding of beauty that music allows. Zander and Philharmonic wove immaculate timbral surroundings. The primed Chorus pro Musica, Jamie Kirsch, music director, fused and empathized with Zander and Mahler especially furthering that which is inscrutable. Yet, the extremely soft singing, those barely heard passages were too distant, unable to establish a presence. The orchestral-vocal drama continued on through the fifth and final movement engaging fully from the standpoint of orchestral-vocal authority and with the pure, almost boy-like voice of mezzo soprano Sonia Tengblad. Absolutely just right playing and distancing were the two off-stage brass ensembles, both evoking a paranormal state altogether gripping. Wanting at times was a tad more sparkle in the upper brass for those military announcements and moments of ecstasy. And for strings and winds, wanting more explicitly spoken tenderness on those sensitive melodic reaches that are ever so Mahleresque. Even with these reservations, this evening was veritable spectacle, integrity omnipresent. To have relived Mahler’s gigantic life and death symphonic inquiry on Good Friday through Benjamin Zander’s vision and among thousands of attendees afforded longed-for escape from traffic, Internet—the busy hum of day-to-day life. Either experience or meditation, a gift.